Cobham robot from Germany. Pict J M M at Villepinte, June 2012. Cobham Robot, Germany. Pict J M M at Villepinte, June 2012. Telemax Robot of German Company Telerob in May 2010 at ELROB in Hammelburg, Germany. Telemax Robot from Germany. Pict J M M at Villepinte, 2006 06. Tracked robots of the 2000. Top : Asendro Scout and bottom : Ofro, tracked robot for surveillance, both of Robowatch Technologies GmbH, Berlin. Pict J M M in 2008 at Villepinte. Tracked robots of the 2000. Pictures J M M at Villepinte except upper center. From L to R and downwards : Telerob tEOD observation robot in 2006, from Telerob, Germany, OTO Melara TRP-1B, Italy, QineticIQbot CBRN surveillance robot in 2004, Telemax in 2006, OTO Melara TRP-1B in 2008, Scorpio in 2006. Qinetiq IQbot CBRN in 2004 from Qinetiq, Farnborough, GB. Soukos Rescue Robot, pictured by J M M in 2002 at Villepinte. Soukos Robots SA., Larisa, Greece, was founded in 1979. Oto Melara Robot TRP-1B. The front part of the tracks can be raised or lowered. Pict J M M at Villepinte, 2002. Saturn robot, 2008, of Stellar Research Services from Southampton for urban reconnaissance contest. Groundhog Observation Robot with wheels and tracks. Pict J M M in 2004 at Villepinte. Chaos Robot from Autonomous Solutions, Utah. Chaos Robot since 2007 from Autonomous Solutions Inc., mendon, UT, can carry loads of 25 kg. 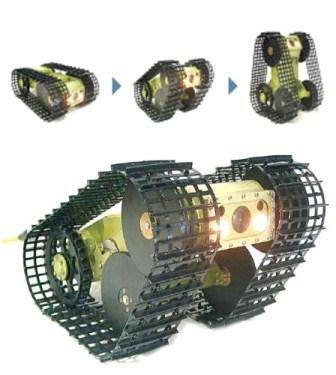 The four independent controlled tracks allow it to crawl or walk on uneven terrains. On this picture, Chaos robot is equipped with a manipulator. WATV tracked and walking robot from Autonomous Solutions, Mendon, Utah and University of Utah in the early 2000. The walking mode added mobility to tracks. This robot led to Chaos robot, of the same manufacturer, which is marketed since mid-2000. Hybrid Mobile Robot, 2008, University of Toronto. The manipulation arm was used for locomotion on uneven terrains. https://tspace.library. Bear Robot of Vecna Robotics, Greenbelt, MD, articulated tracked robots studied since 1999 for logistics, handling, surveillance, search and rescue, security, mine inspection. Powerful robot controlled by hydraulics, very mobile thanks 2 sets of tracks which can walk, and dynamic balancing. Selene Rover LRC, 2008, of Surrey Space Center of University of Surrey. It was the same system as Telemax. http://surreylunarrover. SNR1 or DIR123 of AIST (National Institute of Advanced Industrial Science and Technology), Japan, from 2008. Two triangular tracks and a driven articulated tracked tail make this robot original and efficient. Kenaf Robot of Impress Watch Corporation of NPO/ IRS, International Rescue System, at Hyogo, Japan, in, 2009. Note the tracks witch cover all the width of the robot for better locomotion. http://robot.watch. Robocup 2007 Rescue Robot Ideal, from Youtube. Passive tracks robot seen at Japan Open 2007. From youtube. M-TRAN III (2005) self-reconfiguration robot of AIST, Japan. This lattice structure could be automatically configured into walking robots, crawling snake-like robot or rolling ring. Many laboratories research on this subject like Akiya Kamimyra's Modular Robotic System and else. Soryu, Blue Dragon, 1997, was built by Hirose Fukushima Lab, Tokyo Institute of Technology, as a rescue robot. Pict VSD from 3 to 9 Feb 2000. Robots from Japan : Upper left : Shinobi NuTech-R Nagoaka Univ Of Tech, Lower left ; Univ of Electro-Communications, NIIT Bleue-Japan. Upper Right : c-rescue, Lower Right : NIIT Blue-Japan. Thailand Robots : upper : rescue Saqib 2006 to present from Faculty of Bart Lab Engineering, Mahidol University, Thailande, lower : KMITNB's Team, King Mongkut's Institute of Technology North Bangkok in Thailand Rescue robot contest 2007. Resquake Robot K.N. Toosi University of Iran, 2005 to present. MRK-35 Mobile Surveillance Robot from Rusec. MRK-25 from SRDEB, Special Robotics Experimental Design Bureau rescue robot in mid 80s successfully used to clean Chernobyl nuclear power station. Pict from 'Military Parade', March, April 1998. Eros Robot from INTRA (INTervention Robotique sur Accident) created in 1998 by EDF, CEA and Areva. This indoor articulated robot was pictured by J M Maclou at Open House at Fontenay-aux Roses in 1992. Numerous robots are now stored at Chinon EDF Nuclear Power Plant. Some tracked robots are rather large and mechanical bases comes from civilian market. EOLE robot is issued from Andros Remotec robot. Andros Robot developped in France in the 80s by CEA Commissariat à l'Energie Atomique. In fact, it is isued from the Andros Robot of Remotec, called later EOLE. Teleman Recue Robot for Nuclear Power Plant, 1992, CEA , Fontenay Aux Roses, France. Tracks are fitted with picklocks for better climbing stairs. Frastar II of Framatome, Lyon, in the 80s. Mobile robot from 1989 by Cybernetix, Marseille. Cybernetix robot TSR 200. payload 265 kg, speed 4 km/h, J M M at Engineering Museum, Angers, 2012 11. Xinhuanet robot from China in 2008 for ice and snow surface. Mass 300 kg, payload 40 kg, pulls loads of 100 kg, operational in a radius of 25 km. Reconfigurable robot JL-I developed by Zhang et al. (2006). Each module could move separatly. Aoeba-1 rescue robot built in 2006 by State Key Laboratory of Robotics, China. Last robot from Chinese Accademy of Sciences, 2011. The Menhir, tracked teleoperated robot of the 80s, was built by Cybernetix, Marseille, France, for post accidental intervention in nuclear facilities. Cibernetic is now in Technip Group. Telerob EOD observation robot. Pict J M M at Villepinte, 2006 06. Dragon Runner of Qinetic. Pict J M M at Villepinte, June 2012. CAIR Robots of Center for Artificial Intelligence and Robotics of Bangalore, India. Pict J M M at Villepinte on 2012 06. Stair climbing robot seen on youtube. Canipede robot with 12 powered whegs, built by Mike Keesling. 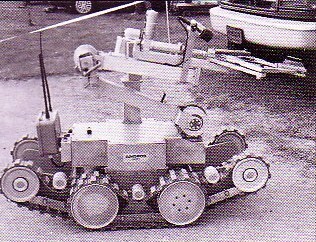 Tracked scale rover of Bekker, 1961. ELMS Rover for Mars exploration in 1985. Pict from review 'Aerospace of America', November 195. MACbot, Multi Active Crawler Robot, in 2008, from Korea University, Seoul, has tracks that can completely revolve on their axle to cross obstacles. Mass : 4 kg. Maximum Height of obstacle : 18 cm. Tracked model with epicyclical tracks. Model and pict J M Maclou, 2009 05. Tracked model with epicyclical tracks built with Meccano/Erector construction set. Tracks lies under the belly and four tracked arms may be rotation free or locked to rotate. Model and pict J M Maclou, 2009 05. Mitsubishi Heavy Industries Robot 85 cm long 35 cm wide, mass 6,3 kg. Composed of 4 articulated lines with 18 wheels each of 4 cm diameter. Designed for moving in atomic power station in 2000. Pict from Sciences et Vie, April 2000. Gavin Miller's snake like robots from the 90s to 2005 could crawl on flat soils and were very realistic. Passive wheels assist movement. ACM-R5 Amphibious robot realized by Shigeo Hirose, Tokyo, which was the first to build snake like robots. This robot moves forward on ground and water by lateral undulating and wheels are not driven. It seems today (May 2011) that snake-like robots propelled by waves cannot progress on uneven grounds like true snakes. This means they need sensors or additional tracks, wheels or legs to move without undulating. Omniped Snake robot propelled by legs (and not waves) of University of Michigan in 2002-2003. Polymorphic Robot could change shape, here it became a wheel. From Youtube : Modular robot's wriggles show greater flexibility. Moira I Snake Robot, 2003, from Osuka Laboratories, Japan. It comprises 4 segments with 2 driven tracks on its four sides for a total of 8 tracks by segment. 2 DOF joints are actuated by pneumatic actuators and it can lift up its nose to overcome obstacles. Moira 2 tracked snake robot developed by Kyoto University is 1,4 m long, 18 kg, particularly suited for rescue operations in Japan or Asia countries since wooden structures leave little space to go through when they collapse. First version dates from 2003. Snake robots at Cargenie Mellon University. ACM-R4 Snake like robot, 2004, from S. Hirose, is similar to ACM-R3 but wheels are driven allowing to cross large obstacles which could not be possible with waves. Moving is not by undulating waves but by wheels and the body is completely articulated. However, this operation is difficult and it is written that sensor signals fitted on the robot would make it automatically adapted to narrow and stepped environment for easy moving on uneven grounds. It seems such a robot doesn't exists today. ACM-R4 snake robot of Hirose in 2004. Each unit has one DOF (Degree Of Freedom) of bending but the next joint is turned of 90°. The wheels are driven which allows to climb this chair. Snake-like robot "SnakeWheel-2" made in 2007 by The State Scientific Center of Russia - Central R&D Institute for Robotics and Technical Cybernetics. KOHGA snake robot of 8 units. Each unit has two tracks except the two heads. These units are serially interconnected with both ends first two joints as 2-DOF active joint and rest of the joints as 3-DOF passive joint. The passive joints provide good adaptation to complex environments. For this reason, KOHGA has high mobility even in rough terrains. Developed by Tokyo Institute of Technology, Yokohama and Matsumo Laboratory of Kyoto University in 2002 for rescue. US006517457-017 of Hagen Schempf, 2003, from Automatika for a one track robot and one track vehicle. Aurora robot of Automatika had Design Excellence Award in 2002. It is marketed today for firefighting and reconnaissance applications or pipe inspection. It incorporates a unique system of steerable and pitchable drive mono-tread. Prototype weights 10 kg. Automatika, O'Hara Township, PA, is a subsidiary of Foster-Miller, Inc., interne owned itself by Qinetic North America (QNA) Company in 2007. Aurora robot of Automatika of Hagen Schempf. A drive-spine and pins are glued on the inner face of the continuous urethane belt, pins are used to drive the belt with the sprockets. The track is guided with the guide-slines. The body is divided in 3 articulated parts. Aurora is driven by batteries and electric motors. Pandora of Automatika, Pittsburg, Pennsylvania is now owned by QinetiQ North America. Interesting tracks that could walk. Pandora is no more manufactured. Andros F6A Surveillance wheeled and tracked robot from Remotec of Northrop Grumman. Pict J M M at Villepinte in 2000. 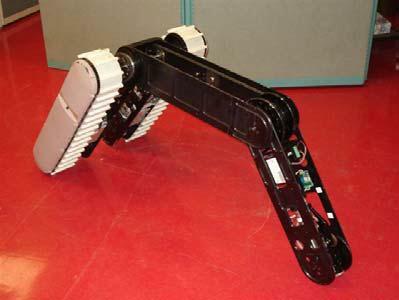 NUGV Robot, Novel Unmanned Ground Robot of Spawar in 2004, improved its mobility by changing its configuration. It was electrically powered and teleoperated.The NUGV was designed and built by ACEi, Valencia, CA, under SPAWAR Systems Center contract. OTO Melara TRP-1B. Track at front is articulated with a cylinder. Pict J M M at Villepinte, 2008 06. Wide Track, 2003, from : www.robotgroup.net at Austin, Texas. MRV-295 robot about early 2000. Helios III Wheel Chair, 1990. http://www-robot.mes.titech.ac.jp/robot/wheeled/helios3/helios3.html http://robot.watch. Hanool's Hanuri-RT rescue robot, 2007, from Seoul, Korea. Injured people must stay on the robot. The sophisticated tracks could allow better off-road performance. http://www.engadget.com/2007/06/01/hanools-hanuri-rt-rescue-bot-touts-go-go-gadget-tracks/ http://us.aving.net/news/view.php? AR2S robot of University of Calgary.